Installation for your espresso machine. 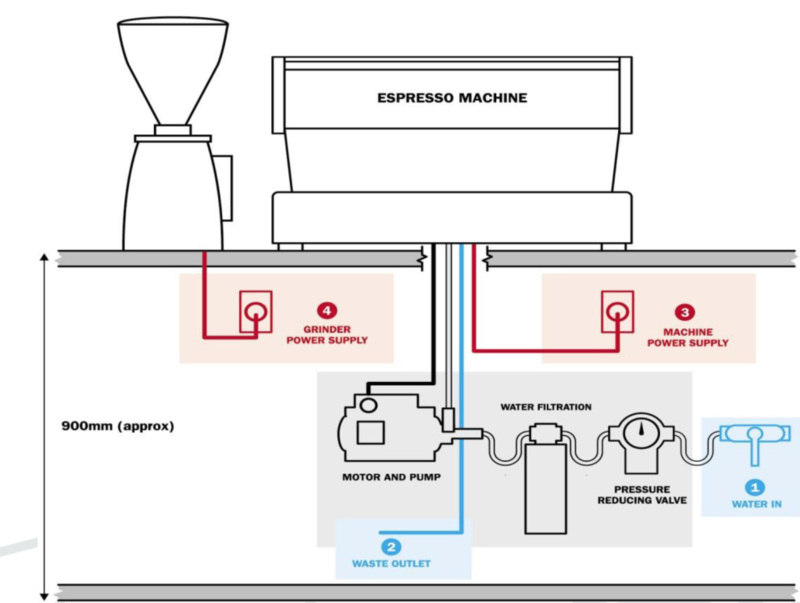 This information is provided as a guide to commercial espresso machine installation. This advice can also be adapted to allow for installation of a plumbed in domestic machine in your home. Here are some tips…Please note that where Talk Coffee is providing installation, a second installation charge is payable if we must reschedule installation should your site not be ready and you have not rescheduled installation. A dry well ventilated bench space, which is between 850mm and 1200mm high, with 150mm clearance around the machine to allow for maintenance and cleaning. An area to be provided next to the espresso machine for a grinder and working area. A dedicated open space directly under the bench measuring at least 45 x 45 x 30 (cm w x h x d) for filter and external motor and pump (when not integral to machine). 75mm hole (domestic 50mm) through the bench, for water pipes and electricity cables. This hole should be sighted at the approximate mid point of the machine- make a template of the machine base and mark an “X” in the exact centre and use this as a drill point guide. For all stone, metal and composite benches, the hole must be drilled prior to the installation. We recommend that a stonemason do this work. We can drill wooden benches if required, but prefer not to. Must be a dedicated cold water outlet, easily accessible. Incoming water between water filtration and espresso machine must be of a hardness greater than 30ppm and less than 150ppm, pH should be between 6.5 and 8.5 and the quantity of chlorides less than 50mg/l (ideally zero). See also our guide to filtration. Mains pressure between 3 and 8Bar (typically via a 1/2″ pipe) to a Duo Valve and a 350kPA limiting valve. A pressure limiting valve will be supplied if you are purchasing filtration from us. Here are some great filtration options which can be connected to your mains inlet. Most espresso machine inlet hoses terminate in a 3/8″ female BSP fitting which will connect directly to a filter. Rocket Espresso domestic machines will also require a 3/8″ female adaptor as their inlet hoses terminate in a male connection. Please note also that connecting the braided inlet hose to Rocket domestic machines will require 2 spanners as the inlet elbow can be damaged if the hose is tightened with one spanner only. If your machine has a resident tank, it must stay in the machine when it is plumbed (n/a LaMarzocco Linea mini and GS3). The water supply should enter the service area low on either side and near to the back surface within 1 metre of the machine. The electrical requirements are a stable 240 Volt single-phase supply with specific current protection ratings as per machine specifications. Espresso machines are generally provided with a 1m lead exiting machine from rear left hand side. Location of GPO should take this into account. Many installations route power through the service hole in the bench for water and drainage. Please note if your power or isolating switches are located in wet areas – weatherproof power options switches such as Clipsal 56 series should be used. Wet areas should be considered in positioning of GPO. Heat Exchanger (HX) commercial machines will generally require a minimum 15A power supply. More complex commercial machines can require require up to 40A. Some 4-5 group machines require 3 phase power. Single group domestic machines require 10A. In domestic installations, a dedicated circuit for the espresso machine is strongly recommended. An additional 10A supply located close to the espresso machine for the grinder. Commercial espresso machines are supplied without a plug on the power cord. Connecting a plug for the electrical supply to the machine this is the responsibility of the installer. Domestic machines are supplied with a 10A domestic power lead with moulded plug. We recommend that you have your electrician test and tag your machine once installation is complete. A 40mm diameter drain-pipe with trap is required. This should allow for direct drainage. Angled drains will block. Drain hose from machine to trap will be provided with your machine.